Matt Foreman h as been involved in Olympic weightlifting since the late 1980s. 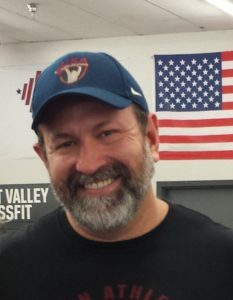 After beginning his competitive career as a junior athlete in Arizona, he was recruited to join the Calpian Weightlifting Club in Washington in 1993. As a member of the Calpians, coached by the legendary John Thrush, Matt rose through the ranks to become one of the best weightlifters in the United States in the +105 kg weight class, winning medals at top national championship meets for over ten years. Still competitive as a masters athlete, he continues into his third decade as an Olympic weightlifter. All the years of experience on the platform have given Coach Foreman an uncommon level of skill and understanding in the coaching realm. He has been a coach almost as long as a competitor, producing athletes who have competed at all national championship levels from youth to master, along with teaching countless clinics and seminars. A prolific writer, he has also published three books on the sport of weightlifting, along with hundreds of articles. The following are some of Coach Foreman’s accomplishments and activities in the iron game. ***Several of Coach Foreman’s athletes have won gold, silver, and bronze medals at these top national competitions. ***In addition to national competition, Coach Foreman has produced dozens of local, state, and regional championships throughout his coaching career. Featured Lecturer at the United States Olympic Training Center in Colorado Springs. Featured article contributor in Performance Menu magazine since 2008. Published author of articles in various other magazines and journals in the fields of Olympic weightlifting, strength training, and track and field. Coach Foreman is one of the few individuals in USA Weightlifting who has both competed and coached on national championship teams.